Vertical parabolas give an important piece of information: When the parabola opens up, the vertex is the lowest point on the graph — called the minimum, or min. When the parabola opens down, the vertex is the highest point on the graph — called the maximum, or max. Only vertical parabolas can have minimum or maximum values, because horizontal parabolas have no limit on how high or how low they can go. Finding the maximum of a parabola can tell you the maximum height of a ball thrown into the air, the maximum area of a rectangle, the minimum value of a company’s profit, and so on. Rearrange the terms in descending order. This step gives you –x2 + 10x = MAX. Factor out the leading term. You now have –1(x2 – 10x) = MAX. This step expands the equation to –1(x2 – 10x + 25) = MAX – 25. Notice that –1 in front of the parentheses turned the 25 into –25, which is why you must add –25 to the right side as well. Factor the information inside the parentheses. This gives you –1(x – 5)2 = MAX – 25. Move the constant to the other side of the equation. You end up with –1(x – 5)2 + 25 = MAX. The vertex of the parabola is (5, 25). Therefore, the number you’re looking for (x) is 5, and the maximum product is 25. You can plug 5 in for x to get y in either equation: 5 + y = 10, or y = 5. Graphing a parabola to find a maximum value from a word problem. 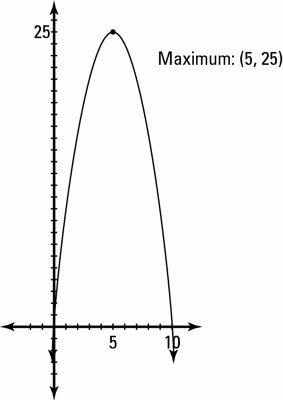 This figure shows the graph of the maximum function to illustrate that the vertex, in this case, is the maximum point.